There is a "high probability" that the England team will not progress to the later stages of this summer's World Cup, a government document says. The statement comes in a study of the possible impact of keeping pubs open late at night for games during the tournament, taking place in Brazil. Labour said this indicated "what the government think" of England's chances. The coalition said its calculations were not an "opinion" but were based on odds on the gambling website Betfair. England manager Roy Hodgson announced his 23-man squad for the World Cup on Monday, with the team's first group-stage game - against Italy - taking place on 14 June. This is followed by clashes with Uruguay and Costa Rica on 19 and 24 June. Because of the late starts, caused by host country Brazil being several hours behind the UK, the government has agreed to allow pubs in England to remain open longer than usual. But in its consultation document, the Home Office assesses the chances of England getting beyond the group. "While England are certain to be playing in the matches in the first period, there is a high probability that they will not be playing in the later matches," it says. "To account for this, we have used odds from Betfair.com, implying that England have a 54% probability of progressing past the group stage and an 11% probability of progressing past the quarter-finals, allowing us to estimate the expected benefits (of opening pubs late)." The last time England got past the quarter finals in a World Cup was in Italy in 1990, where they lost on penalties to Germany in the semi-finals. But, in the House of Lords, Labour's Lord Rosser poured scorn on ministers for their officials' assessment, saying: "It is good to know what the government think of England's prospects." In response, Conservative Home Office minister Lord Taylor of Holbeach, said the work was based on "intellectual rigour". He added: "It says that England are certain to play in the matches of the first period of the tournament - I think we can all agree on that - but that there is a high probability that England will not play in later matches. "That is a matter of opinion, and I am sure that other noble Lords will have different views on that issue. But the use of Betfair and its interactive website was the basis for that assessment." Former England striker Alan Shearer has said Hodgson's squad can get to the semi-finals "at a push". 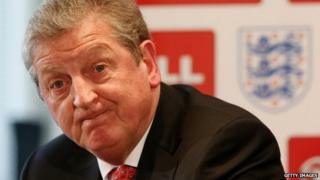 Hodgson has predicted the side can do even better, insisting: "I believe the squad can win the World Cup. Otherwise what's the point?" Paul Waugh, who revealed the downbeat prediction on the PoliticsHome website, wrote "something tells me No 10 or senior ministers may have to be a bit more optimistic". A Home Office spokesman said: "Because we want everyone to get behind the England football team this summer, the government has extended licensing hours so fans can watch England games in pubs. As part of the process for changing licensing hours, the government is obliged to carry out a formal impact assessment. "As part of that assessment, officials used odds from Betfair to estimate the probability of England playing in the knock-out stages. The government is of course 100% behind the England football team and we wish the players every success in the World Cup." The BBC will be providing coverage on TV, radio and online throughout the tournament, which runs from 12 June to 13 July.